When it comes to initially being injured in a car accident, thinking about any type of settlement is probably the last thing you have on your mind. However, once things begin to settle down, thinking about your car accident, the damages that you’ve incurred, the medical treatment, the medical care, lost wages, pain and suffering you’ve endured, and any permanent disability you’ve sustained, will dominate your mind and like any logical person, you’ll want some answers, particularly how long the settlement process takes. Although each individual case is different, there are some key factors to consider to help determine the average time for a car accident settlement. What Is A Car Accident Settlement? What Factors Influence The Average Time For Car Accident Settlement? How Long Does A Car Insurance Claim Take To Settle? What Is The Car Accident Injury Settlement Process? What Is The Auto Accident Settlement Timeline? What Are Average Auto Accident Settlement Amounts? How Much To Expect From a Car Accident Settlement? How Long Do You Have To Wait For The Check After The Settlement? What Should You Do After The Car Accident? What Can A Car Accident Attorney Do To Help? If you are in a car wreck due to someone else’s negligence, you may be entitled to financial damages from the pain and suffering that you’ve endured. Generally, this is in the form of medical treatment, medical care, lost wages, and any permanent disability. In claiming pain and suffering, you seek compensation from the negligent party, who then turns your claim over to their insurance company. If you are able to come to some sort of agreement regarding the pain and suffering you’ve endured, this is called a car accident settlement. However, if you are unable to come to an agreement, then you can ask the Court to award you the pain and suffering you seek through the litigation process by suing the the at fault parties. Since every person’s injury is unique and different, there is no standard settlement or any type of cookie cutter formula. This is why hiring an experienced car accident attorney to advocate on your behalf is important, especially after you’ve already received medical treatment for your injury. What Factors Influence the Average Time for a Car Accident Settlement? How Long Does A Car Insurance Claim Take to Settle? If liability is in dispute, meaning the negligent party’s insurance company is disputing that their insured was at fault, that may complicate the speed at which your car accident settlement may be completed. For instance, if you yourself were ticketed as well as the negligent party, or if negligent party was ticketed but has alleged that you were also partially at-fault, the insurance company may deny your claim and say that they don’t owe you any type of money at all due to lack of liability. Another factor to consider is the medical treatment. Sometimes an insurance company disputes the degree to which you received medical treatment, alleging everything from saying that since the impact was low, how could you receive so much treatment, or saying that most of your treatment was diagnostic in nature, and therefore was unrelated to your injury. Or they may say that you had a preexisting condition prior to the injury, and therefore any treatment received is unrelated to the car accident injury. Disputing medical treatment is how many insurance companies deny or mitigate the amount of damages that are claimed. Accordingly, it is crucial that you have an experienced car accident attorney to be able to respond to the insurance companies denials regarding the treatment you’re claiming to be part of the accident. One of the biggest factors in determining when a car accident settlement will occur is the duration of the medical treatment received, especially if you are currently seeking medical treatment. Since medical treatment received is probably the single biggest factor in claiming the pain and suffering endured, how much and what type of medical treatment received becomes important. Accordingly, if you have to undergo surgery of some sort, this means that your case will take longer to resolve since you’re still treating and it will take longer for you to recover from. Receiving medical treatment, such as a surgery, is not a bad thing. It just means that obviously receiving such treatment may prolong your settlement since your treatment will necessarily be prolonged. On the flip side, your pain and suffering damages may be increased as a result of the surgery you required as a result of the injuries sustained in the car accident. Another factor that may prolong your car accident settlement is any legal or factual issues, such as if the negligent party is a government entity, whether or not there is sufficient coverage available, and obtaining proper legal service. If the negligent party is a government entity, such as if the liable party was a state employee or a police officer, the standard of liability changes. In New York, government entities and non-profits are protected from certain forms of liability and cannot be sued as easily as a private person. Accordingly, this may prolong you from obtaining a good car accident settlement. Similarly, if the liable party has no insurance or if their insurance policy is small and does not cover the amount of damages your claiming, such facts will also cause a delay in obtaining a proper car accident settlement. Normally, without an insurance company to be able to cover your claimed damages, proceeding against the individual driver without insurance or with a small insurance policy definitely makes your settlement more difficult. In those kinds of situation, you’ll have to file a claim against your own uninsured or underinsured policy to be able to make up the difference in damages. This, inevitably, will cause a delay in your car accident settlement. Lastly, if a suit needs to be filed in court, then a summons and complaint needs to drafted and a copy needs to served upon the individual liable party. However, if you are unable to obtain service upon that individual and are unable to locate them and serve them a copy of the complaint, then this too will cause delay in the car accident settlement. Accordingly, how long a car insurance claim takes to settle depends upon the factors above. You should consult an experienced personal injury attorney to help provide you counsel in this area. Another factor that could help dictate the length of time for a car accident settlement is the insurance company itself. All insurance companies are different and some adjusters and insurance companies are easier to work with than others. No adjuster or insurance company is ever the same. Some insurance companies are more settlement prone and are easier to work with in obtaining a car accident settlement. However, other insurance companies may be smaller and the adjuster may never return your phone calls, provide you any correspondence, and limit communication with you to a staggering halt. Accordingly and unfortunately, you may be saddled with an insurance company that is not easy to work with and therefore that could also impact the length of time a car accident settlement will resolve. Generally, the car accident injury process involves certain basic stages. After you file a claim with the insurance company, the first stage is the medical treatment phase. During this stage, the injured party will just focus their attention on attending and receiving the medical treatment for the injury. This may be as little as an emergency room visit followed up with some physical therapy to treat a soft tissue injury, or it could be treatment for a disc herniation or bulging disc that may require surgery. Whatever the treatment is, focus should be on getting better. Once you’re done treating and are considered to have reached the medical maximum improvement, meaning that you don’t have any upcoming or future medical appointment with any doctor(s) and the physician has told you that this is the best you’re going to be as far as your medical condition, then you’re at the gathering stage where you or your attorney will be collecting your medical records and bills. You need to contact an experienced car accident attorney to help you with this so that they can help organize all of the relevant records and bills related to the injury, as well as gather any receipts that you are claiming. The purpose of this is to formulate all of these records so that a demand or “specials” letter is sent to the insurance company to claim money for the pain and suffering you’ve endured. In that letter, your lawyer will detail the theory of your liability, the damages that you suffered, and how you wish to resolve your car accident claim by setting a certain dollar amount to resolve your case. Again, each particular case is different, but an experienced car accident attorney will be able to articulate your position and the basis for it. The third stage is the negotiating stage. In this stage, the insurance company will most likely deny your claim or provide you some sort of initial settlement offer. Your attorney and the insurance company will then negotiate and go back and forth about why they think their side will prevail. 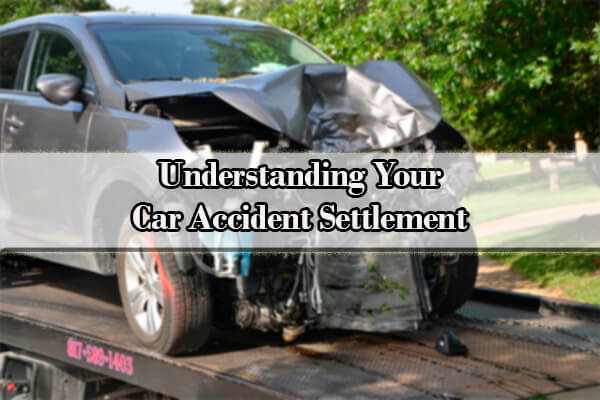 Most of the time this is the final stage and a accident settlement is usually made. However, should the two parties be unable to come to a resolution, the fourth stage is that your case is filed in court. In this stage, a complaint is drafted and served upon the liable party who is then referred to as the “Defendant.” The liable party’s insurance company will then hire a defense insurance company attorney to defend their case. Once the case is filed, that does not mean that the car accident case won’t be resolved or settled, but it can complicate and prolong matters. What happens during the lawsuit after a car accident? Once the Defendant provides an answer to your complaint, the discovery process is next. During the discovery process, each side is able to extract information from each other about what witnesses will be listed, what they will say, and what evidence each side will present. It gives each side a chance to evaluate the other side’s evidence and chances of winning at trial. Unfortunately, this process can take awhile because each side has a chance to interview each other’s witnesses in what’s called a “deposition” or “examination before trial,” also commonly known as an EBT. If you are in a car wreck due to someone else’s negligence, you may be entitled to financial damages from the pain and suffering that you’ve endured. After discovery is completed, each side generally then files various legal motions to try to dismiss the other side’s case. In almost 90% of the time, even if the case is filed in court, a car accident settlement will occur and rarely ever will the case go to trial. However, should each side not be able to come to some sort of compromise, once any legal motions are completed, the next and final step is trial. Although the above is a brief synopsis of the different stages and everything might seem clear and straightforward, having an experienced car accident attorney on your side to help you navigate you through the different stages is ideal. This is especially true in the early stages of the car accident settlement process. Oftentimes, a person may provide a statement or sign a document for the insurance company, without being represented, and that admission may dismantle or hurt their case in the long run, albeit unknowingly. What Are Average Auto Accident Settlement Amounts? How Much To Expect From Car Accident Settlement? There is no magic formula in determining how much the Plaintiff’s damages are. However, one common factor that is usually considered is medical bills. Since a Plaintiff’s pain and suffering is often considered subjective, medical bills are often used as evidence to support a pain and suffering claim. The more medical bills and treatment there is, including surgeries, permanent hardware in the body, and any medical permanent impairments imposed by the car accident, the greater the degree of pain and suffering theoretically the Plaintiff sustained. Another factor that is often considered by a jury and is also more concrete are a Plaintiff’s lost wages. Again, if a Plaintiff was unable to work as a result of the car accident, this means that they sustained a greater degree of pain and suffering. How the car accident affects a particular Plaintiff is also key in valuing damages. If a Plaintiff, for example, is left with a permanent limp, but was formerly a very active person who enjoyed participating in a variety of activities, such as sports, dancing with their spouse, or hunting and fishing, and their damages are based on “loss of quality of life,” this factor will likely be higher in mind of a jury than if he had not been physically active before the injury and maintained a non-active lifestyle. In another example, if the motorcycle accident left Plaintiff permanently disabled in a way that does not affect their occupation or livelihood, obviously that Plaintiff’s damages for lost earning potential will be lower than a Plaintiff whose livelihood is affected by the car accident. However, these factors are not dogma, and because every case and every jury is different, even the best analysis will still only predict pain and suffering damages within a broad range. How Long You Have To Wait For The Check After The Settlement? When Can you Expect a Settlement Check After Car Accident? How long does it take to get a settlement check from a car accident? Once you have agreed to a settlement with the insurance company, although every car accident varies case-by-case, it generally can take between four to six weeks to complete the settlement process before you receive money in your pocket. First, you’ll have to sign a settlement release that settles your claim. In this release it will state that you are giving up your right to sue the person, persons or company who are responsible for your injuries. It will also state that when the insurance company receives the release, you will receive an agreed-upon sum of money in exchange for giving up your claim. Next, after you sign the release, the car accident settlement check will be dispersed to your attorney. First, he or she will pay any liens placed on the settlement funds (such as those for medical bills). Attorney’s fees, out-of-pocket expenses, and other possible costs associated with the claim will also be deducted. After all deductions have been made, typically you will receive the balance of the settlement in the form of a check from your own attorney’s office. Working with a car accident lawyer can help you receive reasonable compensation that may exceed the amount that the insurance company would offer you on your own. An automobile injury attorney will help you present every detail about your case to the insurance company or a judge. Call us for a free consultation on your case. First, you’ll want to report the accident right away. In doing so, you should contact the police immediately, no matter how small or minor the property damage or your bodily injuries are. This will establish official documentation as to the accident. The next thing you should do is gather evidence. You can speak with the liable party to determine if they make any admissions of guilt or fault. Next, you should take pictures of any property damage of the vehicles as well as the scene of accident. You should make note of any skid marks on the ground, the conditions of the road, and the weather conditions. You should also make note of any witnesses who may have seen at the scene of the accident. You should document their names, addresses, and phone numbers. You should seek medical attention immediately. Oftentimes, a victim may wait to go see a doctor. Doing so may deter the validity and legitimacy of any pain and suffering you’re claiming. If you suspect any injury, even if just to get examined as a precaution, then you should seek medical attention immediately. Lastly, you should file a claim with the insurance company. An experienced personal injury attorney will help you file a car accident claim and make sure you don’t say the wrong thing. Q: How Long After A Car Accident Can You Sue? A: In New York, generally, when it comes to accident claims, you have 3 years from the date of accident to file a claim if you were injured in a car accident. This is the car accident insurance claim time limit or what is often called the statute of limitations. However, there may be some exceptions, such as if you are suing a government entity, so you should contact an experienced accident claim lawyer to find out about your particular injury claim. Q: What Is The Average Time For A Car Accident Settlement? A: Although you may be contacted by the insurance company immediately, it can take weeks to several years before your car insurance claim will settle. How long depends on a variety of factors, such as whether liability is in dispute, whether the medical treatment is in dispute, the duration of the medical treatment, legal and factual issues, and the insurance company itself. Q: How Long Does A Car Accident Settlement Take? 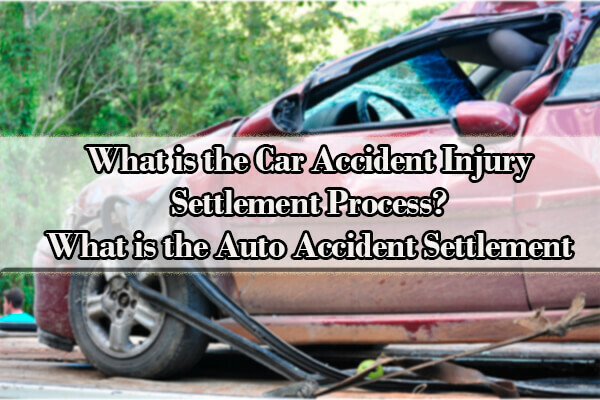 A: Depending upon the factors mentioned above, a settlement can take anywhere from several weeks to years. Again, it is crucial that you consult an experienced auto accident attorney to not only speed up the process, but to maximize your settlement. Q: How Long Does It Take To Get A Settlement Check After A Car Accident? A: Once your settlement is reached, it generally can take between four to six weeks to complete the settlement process before you receive money in your pocket. Q: What Is The Average Car Accident Settlement? A: There is no set formula to determine what your settlement should be for personal injury cases. However, there are a number of factors that will help influence the amount. This includes loss wages, permanent disability, but most importantly, medical treatment and the amount of your medical bills. If you are given an offer by the insurance company, you should consult an experienced car accident attorney immediately to advise you. Q: Will I Need To Pay Taxes On My Settlement Money? A: The IRS has provided some guidance on this issue, but it all comes down to what the settlement covers. If the settlement is intended to cover “physical injuries or physical sickness,” then the award will not be taxable as income, as long as you didn’t previously claim any “medical expense” deductions related to that same injury or illness. Q: How Much Do Insurance Companies Pay For Pain And Suffering? A: Pain and suffering is based upon a number of factors, including loss wages, permanent disability, but most importantly, medical treatment and the amount of your bills. The greater your medical bills, then the greater your pain and suffering you’ve endured. Q: Why Should I Settle My Claim? Shouldn’t I File A Personal Injury Lawsuit? A: You should only settle your claim if it’s a reasonable amount to the pain and suffering you’ve endured. An experienced car accident attorney will be able to advise you what your case is worth and what would be a good settlement. Oftentimes, the insurance company would rather offer you a settlement than hire an attorney and fight the case in court. Accordingly, a settlement is usually just as high, if not higher, than it would be had you waited and filed your case in court. Just because you settle your case out of court doesn’t mean that you’re accepting less than if you field your personal injury lawsuit. Again, consult a car accident attorney to help determine what is your best course of action. A car accident attorney understands the car accident settlement process, the law and what your case is worth. With this information, they are able to defend, negotiate, speed up, and help obtain a good car accident settlement. When it comes to choosing personal injury attorneys, you need to discuss your case with a competent and experienced car accident attorney to discuss how to best pursue your car accident. 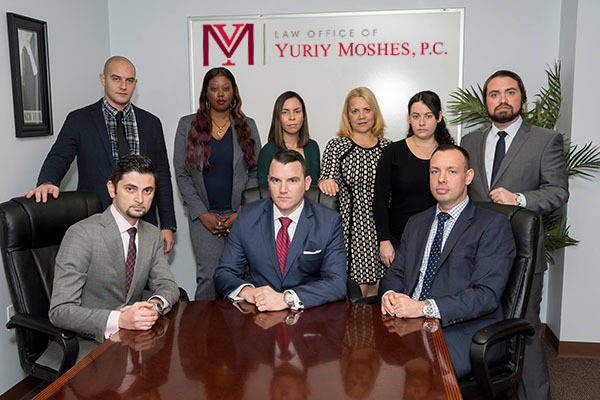 The qualified auto accident attorneys from the Law Office of Yuriy Moshes have the expertise, knowledge, and experience to do this. We help victims in the New York City area including all its boroughs (Manhattan, Brooklyn, Queens, the Bronx and Staten Island) as well as Northern New Jersey, Long Island, and Upstate New York.